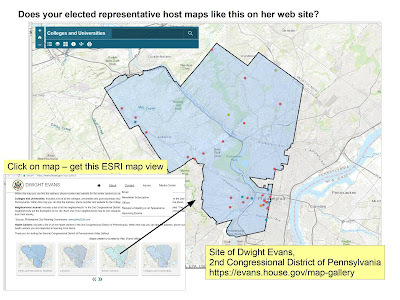 Does Your Elected Representative Have a Map Gallery on Her Web Site? Yesterday I received an email newsletter from Spotlight on Poverty that featured an interview with Dwight Evans of the 2nd Pennsylvania Congressional District. It mentioned that he hosts maps on his web site and I did some digging and interaction with Rep. Evans on Twitter, to find the link. Below is a screen shot of his map gallery page, with a screen shot of the ESRI map that you get when you click on one of the map icons in his gallery. 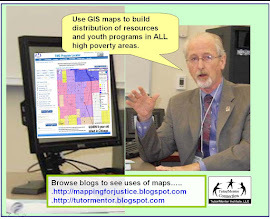 If you spend some time on this blog you can read articles posted since 2008 encouraging Chicago and Illinois politicians to use maps strategically to show where non-school, volunteer-based tutor/mentor programs are needed in their district, who is already there providing these services (and who often need help themselves), and places where the incumbent has delivered needed support. That could be dollars, volunteers, attention, partners, or all of these. My past articles and the maps the Tutor/Mentor Connection created are intended to inspire and serve as templates for work others could be doing in many other places. Click here, here, and here to see a collection of articles. While I focus on helping youth tutor/mentor programs grow, the map platforms and articles that I point to show many indicators of need and could be used to help a wide range of service providers....a comprehensive system of support....be available in different map areas. My father's family is from Philadelphia and I've many siblings, nieces and nephews living there, so I hope Rep. Evans and others will take a look at what I've suggested, and that they will send me links to pages on their web sites where they host map galleries and blog articles showing their use of maps. At the same time, this use of maps should be happening in Chicago, Illinois, every US state and in every big city in the world. However, I can't influence what happens in most of these places because I don't live there. However, there's a strategy that you can follow. 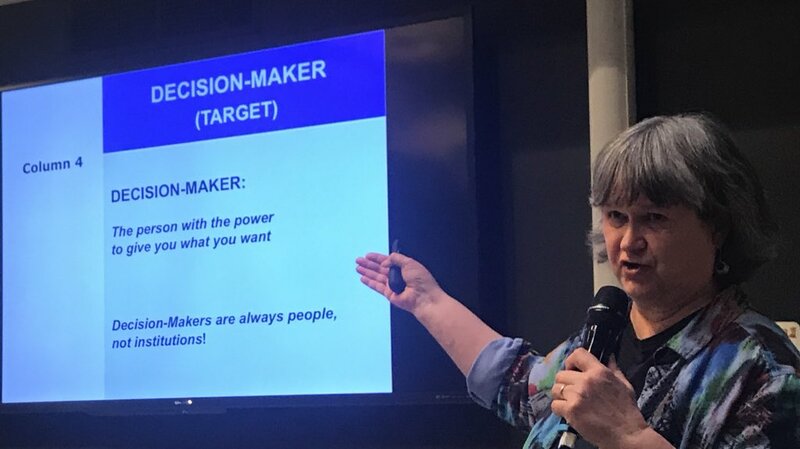 Last Tuesday the weekly ChiHackNight featured Judy Hertz, Executive Director of Midwest Academy She gave an introduction a power analysis, planning and community organizing strategy that I think many could benefit from using. Browse the #ChiHackNight tweets from Tuesday, April 17, and you can see photos and comments from here presentation. Here's the video from Tuesday's session. If you do the research and follow her recommendations, you can help people in every district figure out ways to influence people in power. It's a process. It takes work. The maps can help. 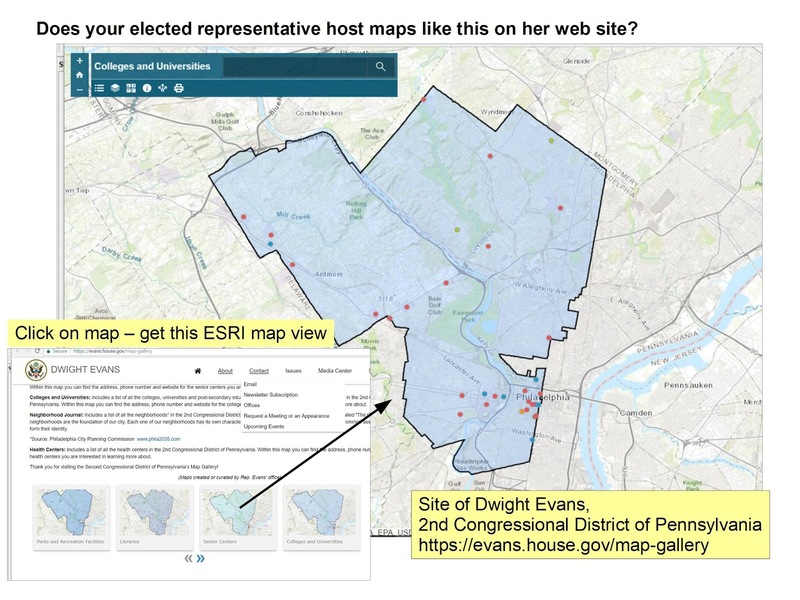 If your elected representative is using maps the way I'm suggesting and hosts a map gallery on his/her web site, send me your examples and I'll add them as updates to this article. 2/25/2019 update - Crime in the 25th Ward - this analysis was produced buy Troy Hernandez, a candidate for Alderman in the 25th Ward of Chicago. Not every politician is a data scientist, but each should have someone working with them who can provide this type of analysis to inform the voters in their district and to guide public policy decisions. My Twitter feed today included a Tweet that introduced me to the JusticeMap project. 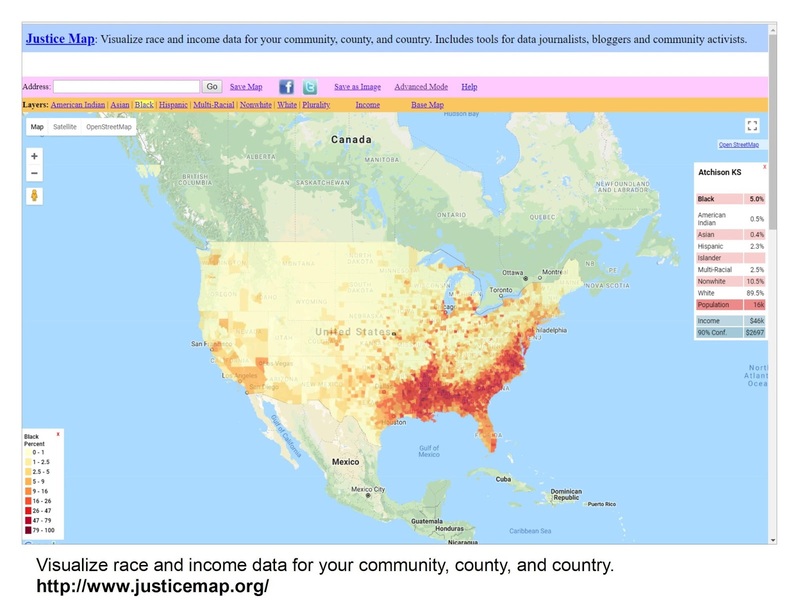 The screen shot at the left shows African American population in the US as a percent of total population. 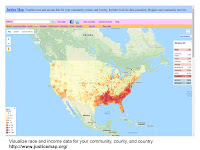 This site enables you to "Visualize race and income data for your community, county, and country. It includes tools for data journalists, bloggers and community activists." It's easy to use. You can click one of the categories on the horizontal bar at the top of the map to create new map views, showing different demographic groups. You can also zoom in to focus on different regions of the country. This map shows the Chicago region. You can zoom in even closer and add street maps, getting you down to the neighborhood level. My goal is that people learn to use maps like these to tell map-stories that point to places where people need extra help, and repeat often enough that people are actually motivated to provide the talent, dollars, ideas and other resources needed to create change where it may be needed. 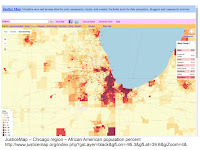 Here's a Tweet showing how someone created a map showing Hispanic population density. 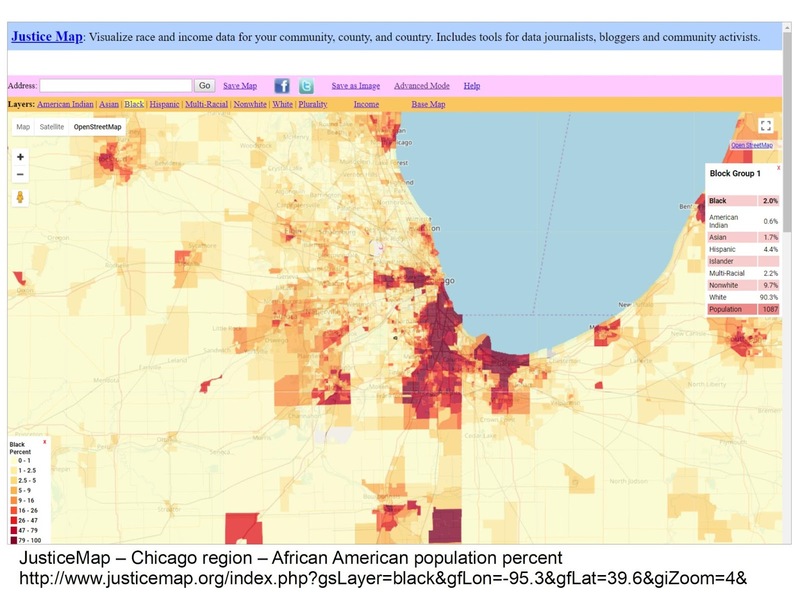 If you skim through past articles on this blog you'll find other data mapping platforms and you'll see many ways I've used maps to tell stories intended to help volunteer-based tutor/mentor programs grow in high poverty areas of Chicago. Browse feed of Tweets by benjancewicz and see how many are interacting with this platform and with each other on Twitter. Create your own map stories and share them on social media. Help build the conversation.